Amazon.com offers the GameSir VX AimSwitch E-Sports Keypad Mouse Combo for $84.99. via coupon code MV77VUSG . One Combo for All Consoles: GameSir VX AimSwitch supports mainstream consoles: Xbox One, PlayStation 4, PlayStation 3, Switch and PC. 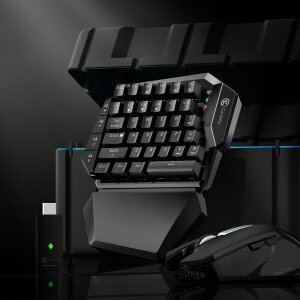 Working Distance: GameSir Agility X technology enables stable and instant wireless keyboard connection with maximum 32.8 ft control range. TTC Mechanical Blue Key Switches Keyboard: The mechanical keyboard with 38 TTC mechanical blue key switches deliver low resistance and fast response rate. And the slidable and detachable palmrest perfectly suits different gestures.